in context. This is part of pre-writing I did before beginning my written thesis entitled, The Grid & The Tactile Vessel*. It is an attempt to articulate a theme that at the time I wished to tackle academically, and therefore it is fragmented and personal. As this work continues to develop for publishing, I hope to open a dialect in order to inspire invention, growth & critique. *In May 2017 I graduated from Philadelphia University with a Master of Science in Textile Design. My thesis concluded in academic writing, a small published book, and a gallery installation (Textile Language) in Philadelphia. When I was six I experienced a significant loss that forced me to focus outside of myself. I remember this feeling from my childhood, just like I remember the polyester blended blue couch in our living room smelled like toast, and the sunflowers in our backyard were so tall and top heavy that they dipped in the wind – almost as if bowing to an unseen audience. One of these moments, as if frozen in time and placed delicately in the palm of my hands, is so visceral it has stuck in the space between my eyes and their lids, playing over and over whenever I close them. This moment defined my relationship to the earth, to memory, and the sacredness of landscape. Land and the connection I have with ‘place’ is what drew me into the practice of weaving. Employing the body as a receptacle to create, through movement and emotion, strengthened my link to heirloom and sacred space. It is in these moments that I feel most at home: intuitively creating at the loom, unconsciously drawing from my surroundings and in motion, yet in place. Understanding ‘place’ in the context of this collection of woven work is important not only to understand the conceptual launch, but also the emotional relationship between maker and object. Place is an instance of connection to something larger than yourself, grounded in the inward reaction to these moments, and the manner with which they are preserved in memory through the senses. Although place can be a literal landscape or area of ground, it can also be an interaction, a feeling, a thought. These textiles are objects of memory, meant to provoke physical feelings connected to specific places of meaning. Moments of wishing a place still existed, recreating lost spaces, spaces of personal value, and collections of places. They exist as a vessel between place and body, carrying sentiment and reaction. Some moments in everyday space are so beautiful and remarkable, they create instances of wonder that slow time to preserve memory, and leave a lasting memorial. These are the quiet moments of sacred space, the imperfections that make beauty real. Recognizing these precious spaces and imperfections as wonder, sparks a response of genuine trueness that became the conceptual launch of The Sister Blankets Collection. 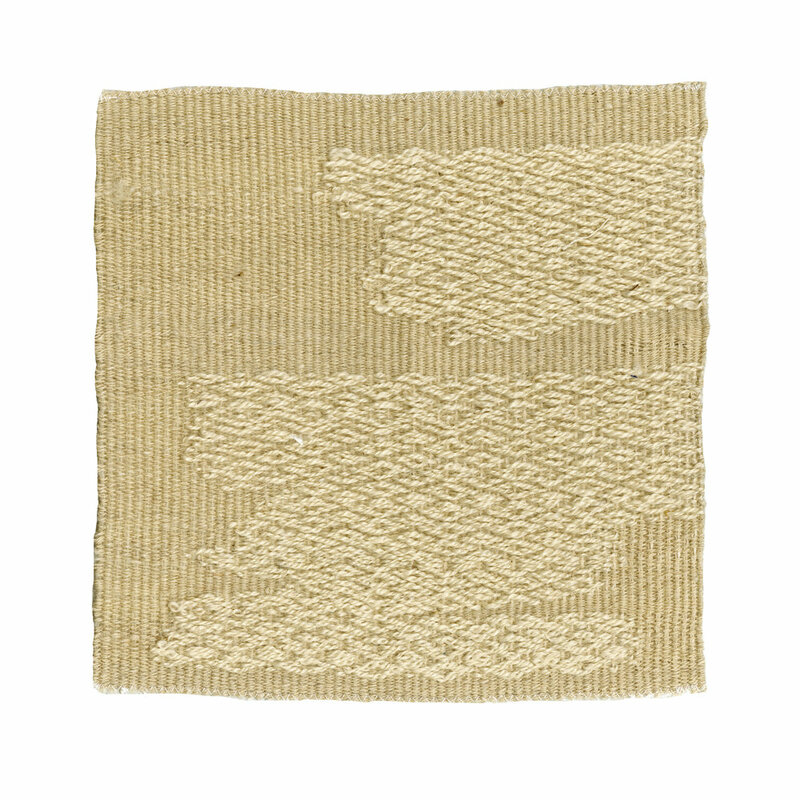 These weavings are a celebration of captured instances: abstracted, quiet and subtle. The title of this collection stems from a coverlet weave structure, chosen as a nod to timeless heirloom and the relationship to body and space. Through scale, color, and texture, these textiles craft illustrations of remembrance and preservation through the physical language they share. Small imperfections: throwing a pick out of sequence, or the natural discoloration of a cone of cotton yarn that has sat in a windowsill under the sun for too long, are forever celebrated. They are not undone or remade – they are preserved, acting as link between hand and cloth. Early development of this body of work began with the parameters to create a collection of ‘one color’ textiles – to remove color as part of the design decision, and focus on structure and texture. I started with cream fibers, later adding in shades of white and grey. Material, along with scale, played a significant role in the scope of experimentation and structure that was achieved. Making conscious material choices along with intuitive design decisions while at the loom, meant limitless studies of abstract shape, investigational form, and structure play. This also meant that using the same cotton or linen warp produced unlimited versions and interpretations of the same design, unlike other sampling of the same nature. 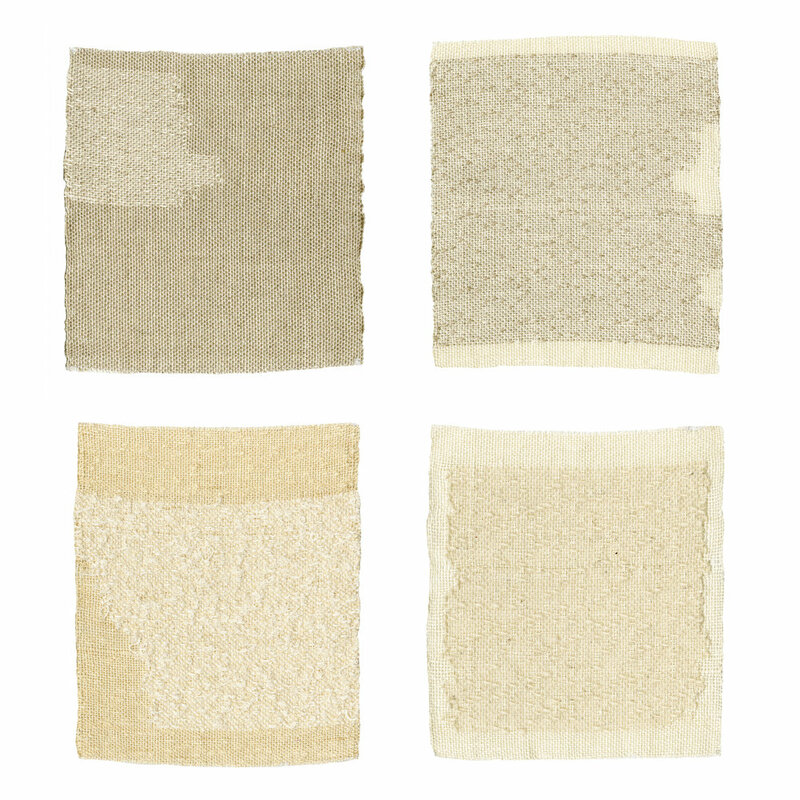 To create a natural progression and connection to The Vessel Collection (not shown), I continued to use a 2-ply cream cotton warp, however broadening the parameters of weft materials. Weft was chosen based on texture and uniqueness, and a broad range of fiber content was explored. Weft fibers include chenille, wool roving, recycled plastic yarns, alpaca, knitted rayon, slub yarns, mohair, and plied cotton. Like the sacred spaces these textiles captured, these weavings are precious and ephemeral, paying close attention to scale and physical connection. Relying on their shape and texture to communicate a story, the small size of these weavings force an intimacy from textile to body. This interaction creates an emotional response, connecting cloth to memory, and instilling memory in cloth. The broad range of shape achieved from the same warp relies on a weave structure that supports tabby, allowing me to use two shuttles and draw with a ‘supplemental’ weft on the loom. This concept originated after studying coverlet structures, which rely on a tabby pick in-between picks of the overshot design. Creating structures that allowed for a pick of tabby without compromising the original structure, meant that abstract shapes could be ‘drawn’ with an additional shuttle. Essentially, these weavings were created by a pick-and-pick design, first throwing a pick of tabby that traveled the entire length of the cloth and acted as a ground. A second shuttle was then used to throw a pick of the weave structure, however in a tapestry method. This can easily be conceptualized by imagining the weave draft as a double cloth, however only weaving with one layer on the loom. During this experimentation, I most often used a straight draw weave structure, therefore allowing me to change the weave at any point in the design by changing the treadling tie-up. The versatility of a straight draw, and the countless patterns that can be crafted using this draw-in, meant achieving multiple weave structures in one sample was a possibility. As The Sister Blankets Collection began to take shape, a pull towards natural fibers re-emerged, for the sustainable value and physical quality of the yarns. The nature of touch led me to source linen grown in Belgium and spun in Italy. Weaving with yarns that had been grown to preserve the production of organic fiber created another dimension of place, and a new bond between textile and body, body and land. The first trial warp was 100% unbleached 10/2 linen, dressed as a single cloth on the compu-dobby loom. A few samples were produced, but after tension trouble the warp was repurposed as weft, and a new cottolin warp (sourced from Canada) was made. Cottolin is a mixed fiber made of cotton and linen, blending the look of linen with the flexibility and touch of cotton. I designed a texture-heavy weave structure, using small random floats to add dimension and movement within these small samples, all 7”x7”. Although the structure allowed for several different iterations, I found the arrangement of a pre-planned treadling sequence on the compu-dobby loom limiting. The organic design decisions I could make on a floor loom by simply moving my feet in a different order was lost on the compu-dobby, as I had to stop the rhythm of weaving to edit the structure on the computer. Through this process, I began to understand that my physical connection to the loom was inherent to my practice of making. Chapter 6: Introduction On Loom, Part 1, pre-writing excerpt from The Grid & The Tactile Vessel written by Rachel Snack, 2017.